It's transition time in Dallas. The decision by General Manager Joe Nieuwendyk to let franchise icons Mike Modano and Marty Turco leave as free agents officially launches the Stars into a new era. Modano, the highest-scoring U.S.-born player in NHL history, was no longer a major force on offense. But he was still the face of the franchise -- something he's been since the Stars moved from Minnesota in 1993. Turco's path to free agency was paved late last season, when the Stars acquired goaltender Kari Lehtonen from Atlanta and signed him to a three-year contract. In truth, it's been a tough couple of seasons in Dallas. 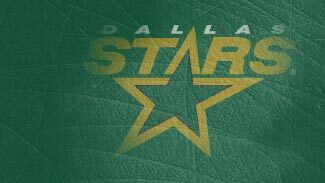 After making the Western Conference Finals and pushing Detroit to six games in the spring of 2008, the Stars have missed the playoffs in consecutive seasons. Dallas was actually slightly better in 2009-10 under new coach Marc Crawford, but an improvement from 83 points to 88 was nowhere near enough to get back into the Stanley Cup Playoffs. The back-to-back misses marked the first time the franchise had failed to make the playoffs in consecutive years since the then-North Stars did it in 1987 and '88. With longtime owner Tom Hicks preparing to sell the team, Nieuwendyk didn't have a lot of financial flexibility to make many offseason moves, so the Stars will bank on the improvement of some of their young players and draft picks (the AHL Texas Stars made the Calder Cup Finals) as they try to avoid missing the playoffs three years in a row -- something that hasn't happened since the mid-1970s. Few teams in any sport have had two players so identified with their franchise leave at the same time as the Stars did by letting Modano and Turco depart. Modano hasn't been a dynamic offensive player for several seasons. But having been with the North Stars/Stars franchise since 1988, he had long been the team's most visible presence in the area. Modano had 14 goals and 30 points last season, not bad for a guy who turned 40 in June, but not enough to convince Nieuwendyk to bring back his former teammate. His departure leaves a hole in the franchise, as well as the need for someone to step into a third- or fourth-line role. It will also open up some time on the power play. Youngster Jamie Benn, who scored 22 goals as a rookie and then excelled with Texas during the AHL playoffs, could find himself ticketed for a bigger role. Turco's play improved last season (22-20-11, 2.72 goals-against average) after a disappointing showing in 2008-09. But the Stars' franchise leader in games played (509) wins (262) and shutouts turns 35 this summer, and Nieuwendyk felt as last season went along that new blood was needed -- he dealt minor-league defenseman Ivan Vishnevskiy to Atlanta to get Lehtonen, then let Turco leave after the two split time over the final few weeks of the season. 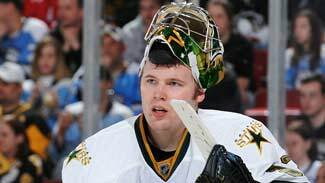 The decision to let Turco go puts the onus squarely on Lehtonen, who was picked No. 2 by Atlanta in the 2002 Entry Draft but has seen his career plagued by injuries and inconsistency. The Stars saw enough promise to keep Lehtonen and let their longtime goaltender walk away. KARI LEHTONEN, G -- The Stars are banking on the injury-plagued goaltender to fulfill the potential that made him the No. 2 pick in the 2002 Entry Draft. Atlanta got tired of waiting and sent him to Dallas late last season; he was 6-4-0 as a Star with a 2.81 goals-against average and .911 save percentage. SCOTT GLENNIE, RW -- The Stars let Glennie stay in juniors last season after choosing him with the eighth pick in the 2009 Entry Draft. He may be ready for an NHL gig after putting up 32 goals and 89 points while leading Brandon to the Memorial Cup final. ADAM BURISH, RW -- Burish brings a Stanley Cup ring to Dallas after helping the Chicago Blackhawks end their 49-year championship drought. Though he missed most of last season with a knee injury that required surgery, the Stars expect him to bring grit and make them a harder team to play against. Nieuwendyk didn't do a lot of shopping in the early days of free agency, but he did bring in some more grit by signing ex-Blackhawks forward Adam Burish and some insurance against another injury to Lehtonen by inking backup goaltender Andrew Raycroft. Burish brings a Stanley Cup ring to Chicago and is the kind of gritty player Crawford loves. He missed all but 13 games last season with a knee injury, but is still only 27 and should team with Steve Ott to make the Stars a lot more unpleasant to play against. Raycroft, who backed up Roberto Luongo in Vancouver last season, has had his ups and downs since winning the Calder Trophy as the NHL's top rookie in 2003-04. He was an effective backup to Luongo with the Canucks, going 9-5-1 with a 2.42 goals-against average and gives the Stars a veteran who can fill in as a starter if necessary. The Stars also brought back veteran defenseman Brad Lukowich, along with youngsters Maxime Fortunas, who played eight games in Dallas last season, and Trevor Ludwig, who's a long shot to make the team but adds depth to the organization. Philip Larsen, a 20-year-old Dane who also got a brief look last season, could earn a job. The Stars have hopes that 2009 first-rounder Scott Glennie may be ready to contribute at the NHL level, signing him to a three-year, entry-level deal during the offseason. Glennie had 32 goals and 89 points in 68 games for Brandon last season and helped lead the Wheat Kings to the Memorial Cup final. They hope he'll be able to follow in the footsteps of Benn, who played so well in training camp that the Stars couldn't send him down and proceeded to score 22 goals and 41 points as a rookie. Beyond that, there are jobs to be won by young players such as Raymond Sawada, who's had a couple of quick call-ups. Don't be surprised if Nieuwendyk keeps shopping even through training camp. With their franchise icons now gone, the Stars are in a transition mode. There are still some nice pieces up front. Brad Richards had a 91-point season that included 67 assists, many of them to Loui Eriksson, who had 29 goals and a career-high 71 points. Second-year center James Neal, who's also going to be expected to do more, improved to 27 goals and 55 points. Captain Brendan Morrow had 20 goals and 46 points after missing most of '08-09 with a knee injury that required surgery. A return to his pre-injury form (32 goals and 76 points in 2007-08) would help a lot. So would another 20-goal season from Ott, who found a scoring touch (22 goals) to go with his grinding, irritating style of play. Stephane Robidas (10-31-41) is the leader of a defensive unit that's very young -- only Karlis Skrastins (36) is older than 26. The Stars really need youngsters like Larsen, Marc Fistric, Nicklas Grossman and Matt Niskanen to step up into more substantial roles. Nieuwendyk rolled the dice by bringing in Lehtonen, whose injury history is so extensive that it's impossible to say if he can carry the load. If not, Raycroft figures to be a competent backup while No. 1 draft pick Jack Campbell continues to mature. The Stars will be younger this season without their two franchise icons. Nieuwendyk is banking on Lehtonen and the continued maturing of some of his youngsters to make them better, too.